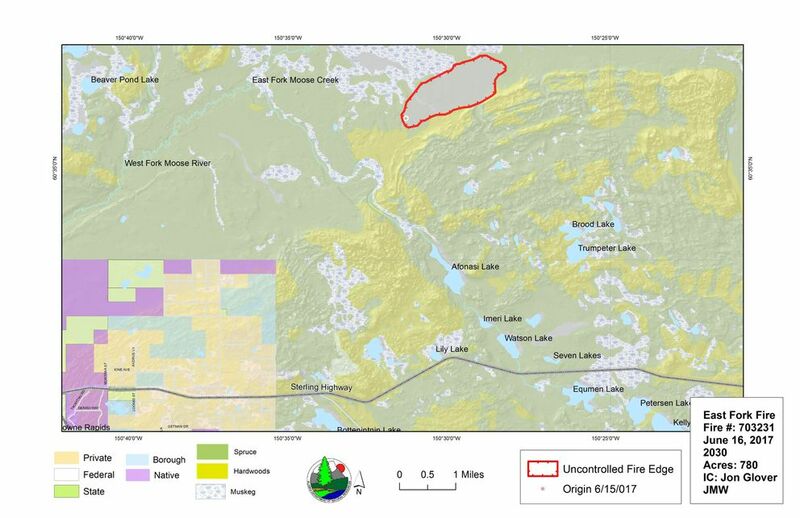 More than 80 people so far are responding to the wildfire, which is burning quickly through black spruce about 4 miles from the Sterling Highway. An air tanker and two planes were scooping up water. Fire managers are letting the blaze burn in the north part of the refuge, where there are no structures and lots of dead plant material, Prescott said. But Prescott said fire crews are working to contain the southwest corner of the fire, about 3.5 miles away from the nearest home. "Our main objective is to keep it from moving any farther from the west to south," Prescott said. "As long as it's north and east, it's doing good for what it needs to do." There's no immediate threat at this time, officials said Friday night. Light winds pushed the smoke from the fire north to Anchorage and the Mat-Su Borough overnight Saturday. In a community message Friday night, Anchorage fire officials pleaded with residents not to call 911 to report the smoke. "Please try to confirm an active fire or column of smoke when calling 911," the statement said. A separate health advisory from the fire department warned that even healthy residents could be irritated by wildfire smoke during strenuous exercise. Those with chronic respiratory diseases, as well as older adults and children, are more likely to be affected.